Winter weather can take its toll on a house in big ways and in small ways. From leaves accumulating in the gutter to structural damage, there is a lot to check when the weather turns warm. To help you protect your most valuable asset – your home – be on the lookout for these potential issues and learn how to fix them. With the winds we had this winter, be sure to inspect your roof to make sure the shingles are in good condition. The easiest and safest way to inspect your roof is to use binoculars, advises Dan Nelson, store manager of Spenard Builders Supply. 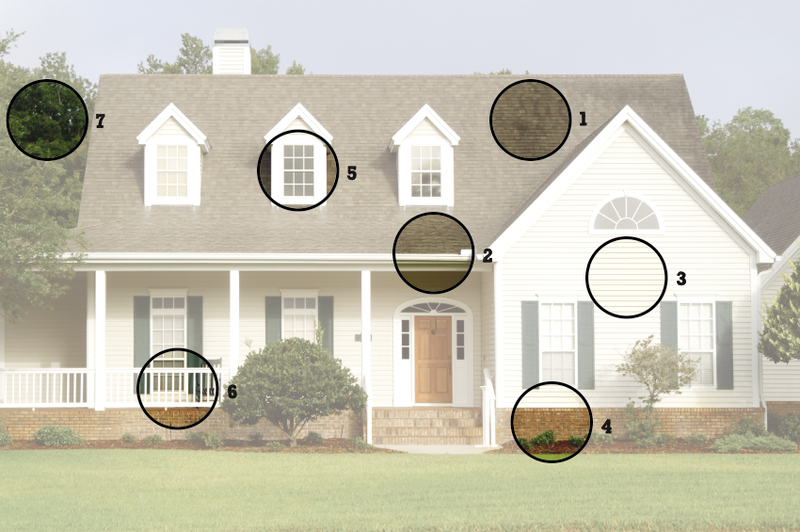 Look for missing, damaged or curling shingles, and any other signs of wear and tear. Trim any branches that hang over the roof and remove any excess debris like sticks and leaves that can clog the gutters or cause algae to grow. Moss or algae growing on the roof can be a difficult problem to resolve, says Nelson. The age of the shingles and the shape they are in greatly affects how aggressive you can be in the removal process. Start with a mild cleaning solution designed to remove moss and algae on an inconspicuous part of the roof. Read and follow all manufacturer directions carefully. Pressure washing the roof is an option but care needs to be taken to ensure the shingles are not damaged while trying to remove the moss. One of the most effective ways to prevent moss is to install zinc or copper strips, advises Nelson. Then when it rains, a small bit of the metal is released and prevents the algae or moss from growing. Check caps on the furnace and boiler exhausts, bathroom vents and kitchen hood vents. If they are missing, replace them. Check for ice damming and install heat tapes where needed. Check flashing and any crickets installed on your roof. Clean the flue of wood burning fireplace chimneys. Check metal areas for rust. Examine your interior ceiling or attic. Look for signs of leaking like dark spots on the ceiling, mold or dampness in the attic. Regular cleaning of your gutters can help prevent costly damage like cracked foundations, puddles or rotting wood. Make sure you have a steady ladder and that it’s not leaning and putting pressure on your gutters. Use a trowel or a gloved hand to scoop leaves and debris into a bucket. If your roof isn’t too steep, it may be more efficient to climb onto the roof and work from above. Once the gutters are clear, use a hose to remove dirt and small particles. This is a good time to check for leaks, and to make sure the water is flowing down the downspout. Be sure that your downspouts carry water three to four feet away from your foundation to prevent water from running back into your foundation. Inspect the gutters and flashing for missing nails, loose downspouts and joints, dents and rust. If your gutters were installed using the old spike and ferrell system (a long nail driven through the face of the gutter), examine the top edge of the gutters to make sure the ice build up over the winter didn’t pull them away, says Jeff Raisanen of ABC Seamless. If needed, use a hammer to pound the spike back snug to the gutter. A home’s siding is more than just protection from the elements; it’s also curb appeal and home value. Most siding requires little attention, but without proper annual maintenance it can become worn and damaged. Maintenance will vary depending on what type of siding is installed. For wood shakes and shingles, check for moisture behind shingles then paint or stain, as needed. Painting should be done every five to seven years, and staining every three years. Note that composition board siding, which doesn’t hold paint as well, will need to be painted more often. Wash vinyl siding to eliminate dirt, grass stains and mold. For heavier stains, vinyl siding can be cleaned with a soft cloth or soft bristled toothbrush if the surface is textured. For steel siding, look for loose fasteners or joints that may need new sealant. If needed, wash panel surface with a mild detergent, water and soft cloth. Severe scratches, dents and holes will require panel replacement. For plywood siding, look for expanding and contracting of the wood, which can cause nails to pull out, joints to pull apart and siding to fall off. Keep the surface finishes fresh or plywood siding will deteriorate, absorb moisture and warp. For your exterior paint, Ron Adams of Adams Family Painting recommends a light power wash to remove silt, webs and beehives. Keep plants a foot away from the house as they hold water in the ground, and wash mold areas with bleach and water, then allow to dry and seal. Is your yard sloping back into your home? Grading around the foundation is one of the biggest neglected aspects of the home’s exterior, says Cody Lee of Grayling Construction. The ground should slope away from the house so water doesn’t pool near your foundation. As mentioned above, gutter downspouts should be funneling at least three to four feet away from your home. It’s also important to walk around the exterior of your home to look for cracks. Small hairline cracks aren’t normally a cause for concern, and can be filled with an epoxy-injection system. But it is a good idea to keep an eye on them to make sure they don’t get bigger (or wider than 3/16 inch). Bigger openings are a sign of a bigger problem, says David Northup of Northup Construction and Techno Metal Post Alaska. Another possible sign of a foundation problem are doors and windows that are hard to open. Mark smaller cracks with tape and monitor their progress over the coming months. Consult a professional if you notice any signs that cracks are growing wider or bulging or buckling. The longer you wait to correct a problem, the more costly it will probably be. Freeze-thaw cycles can cause some shifting, says Stacey Dean of Grayling Construction. Exterior doors might need hinge and lock adjustments to close properly. “If you have any gaps in your doors or windows, you may need to reapply caulking,” she advises. If you can see daylight around your doors, apply weather stripping – a resilient material designed to act as a barrier in the space between the sash and frame to reduce air and water infiltration. Glass care today is more important than ever, according to Carol Kipfer of Shiloh Windows & Doors. Insulating, low-e or heat reflective glass requires proper maintenance to ensure their complete effectiveness. Clean frames and glass with a mixture of mild dish soap and water. Clean screens by first removing, then washing on a flat, clean surface with mild soap and water and a soft brush. Rinse, wipe dry and reinstall. This is also a good time to check your screens for holes and patch or replace where needed. Resealing your deck is an important part of maintaining the exterior of the home. Not only will it extend the life of the wood, it will create a more beautiful outdoor space for you and your family to enjoy. Wood decks need to be stained with an oil-based, deep penetrating stain on a regular basis to maintain the rich colors most prefer. If it’s been a while since the last application then a good sanding may be needed and a stain applied soon after. When staining a deck, says Derrick Jabaay of Treeline Construction, “surface preparation is everything!” Keep in mind that the darker the stain the better it’s resistance to UV exposure. Be sure to do any sanding work as needed and properly apply a deck cleaner, then a wood conditioner. The deck cleaner helps to remove dirt, grime, mildew and soft spots, while the conditioner helps to remove rust and corrosion and prepares the surface to more uniformly accept a stain. The conditioner neutralizes tannic acids found in cedar, Ipe and other “decay resistant wood,” and balances PH levels, and opens wood pores. If a deck is stained without following these basic practices, more harm could be caused to the deck than if it was never stained in the first place, says Jabaay. For a good deck cleaner, Stacey recommends Cabot’s Problem Solver Wood Cleaner available at Spenard Builders Supply. Simply spray it on, and wash it off. Now you can re-stain, or clear coat your wood deck. Check footings for deterioration, sinking, jacking or heaving, and proper connections. Check framing for rot and overall integrity (loose connections, bent or bowed framing members, etc.). Check guardrails for rot, general deterioration and overall integrity. Check to make sure any wood framing is not in contact with soil. Any soil contact expedites rot as well as giving frost a “pushing point” to heave during winter. Check the structural integrity of connection of stairs to deck – especially important on larger staircases. Check all fasteners and metal hardware for corrosion. Corrosion causes these connections to fail. Insect control is another important consideration in maintaining tree health. Many of Alaska's trees are susceptible to infestations that can lead to stunted growth or even death. Insects such as aphids and birch leaf minors, larch sawflies and yellowheaded spruce sawflies can cause irreversible damage over a short period of time. These pests can be identified by a certified arborist and successfully treated to minimize tree damage.